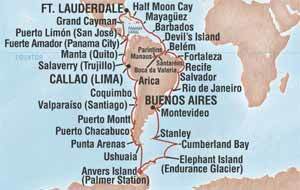 For those of you who may already be trying to figure out what to get me for Christmas, or maybe not me, but a close friend, may I recommend the GRAND SOUTH AMERICA ANTARCTICAVOYAGE. This 68 day cruise offered by Holland America departs January 3, 2008...and while I would enjoy a Penthouse room for $208,000, I would even be willing to except the standard inside room on a sub-prime deck for $20,000, but if I'm at sea for over two months without a window, is that really fair? My friends Jon and Grete (pictured above with Effie White aka Jennifer Hudson) got a chance of a life time to be seatfillers for the SAG awards this past weekend. Grete is a People Magazine with legs and on her blog CaLIfe discusses the experience of being a seat filler, as well as attaches an impressive list at the bottom of her post of the people she saw, talked to, and sat in seats for. Needless, to say, I'm very jealous. If they ever are Academy Award seatfillers, I don't even think I want to know. 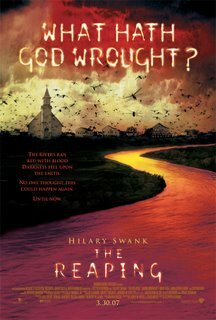 In July 2006 I wrote a post about the film The Reaping, an incredibly cheesy film staring Hillary Swank which deals with the ten plagues of Exodus hitting a small Louisianna town. This film originally scheduled for release August 11, 2006 originally made my vomit enducing film list last May, but of the 17 films on the vomit list, this was the only film that was not released last summer. The Reaping is now scheduled for release March 30, 2007 and in the meantime they have made up a new poster, and have replaced the hideously aweful tagline, or at least the wordy first part. 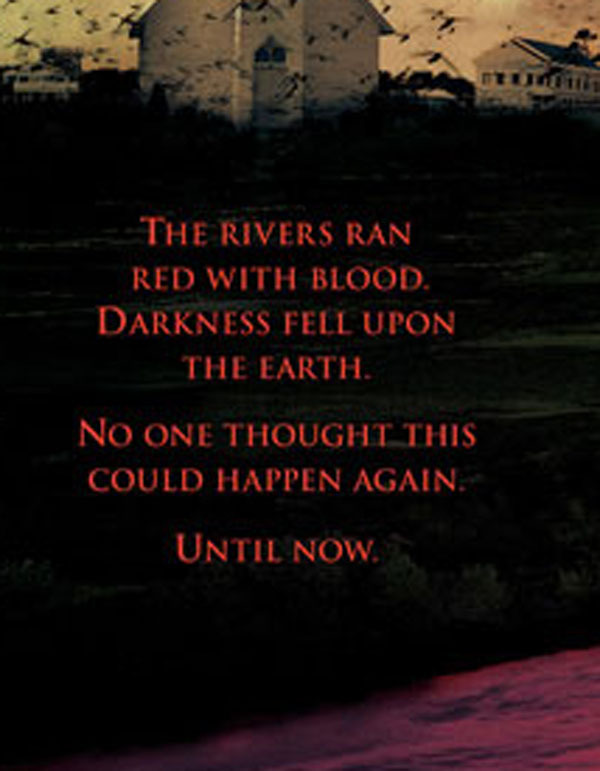 The new ominous red poster is pictured above. The original poster showing Hilary Swank is also pictured, as well as it's horrible tagline. 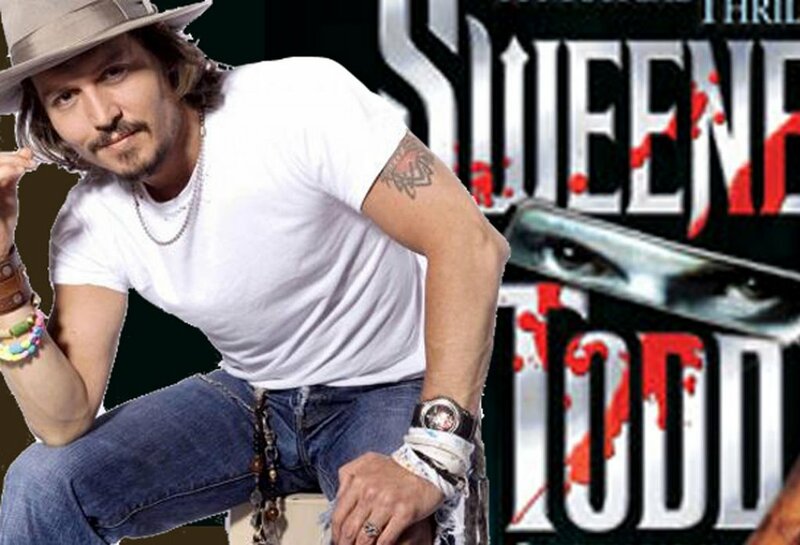 The two taglines are posted below. The newest tagline has a much better flow. Also, they have added a 2nd headline saying "What Hath God Wrought?" 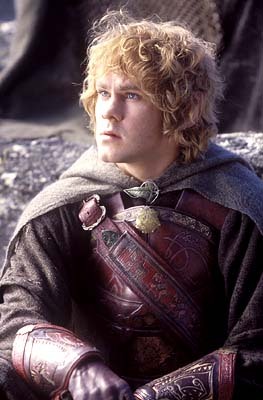 It's clear that the 2006 campaign had a tone that was off, and this film was simply weak. But it is also clear that 2006 was a good year for the horror genre, in fact studios were milking it with multiple horror movies coming out every month, even films like Black Christmas in December. Even this Spring before the Reaping is even released... Lionsgate is releasing the Abandoned in February and Captivity in March, while Sony/Columbia also have Sandra Bullock's Premonition coming out in March, Universal is releasing Dead Silence, and Fox Atomic is releasing the Hills Have Eyes II. Is there room for films like The Reaping? I was glad I didn't see An Inconvinient Truth in the movie theater, but rather from the comfort of my own home. Because buying 2 ticket to see An Inconveient Truth would be by far had made me feel ripped off. This movie, a lecture on the severe realities of global warning would be no more than a high school science class film if it wasn't for the fact that Al Gore does the narration, and personal/political interjections splice up the film, giving a context for Gore's concern and thought process. The film's content is great, but as far as a documentary goes, the sporadic TV director (and husband of Elizabeth Shue) Davis Guggenheim, really chose an unengaging approach to delivering the message. This is certainly not an investigative documentary like Bowling For Columbine, or heartfelt or touching, like Born Into Brothels. And the reality is, in many ways, it's really not that informative. By informative, I mean that it doesn't reveal anything new to the typical viewer. 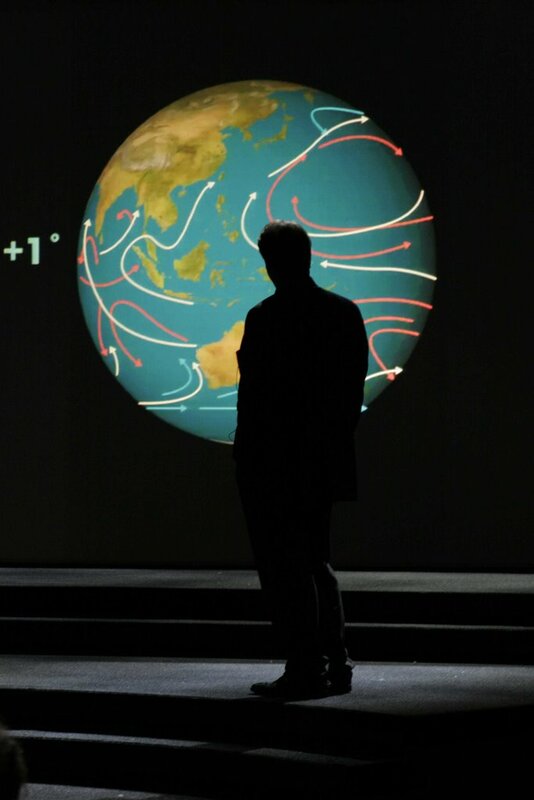 The overarching rhetoric of the film is that Global Warming exhist, here are the numbers and the facts, demonstrated with hi-tech graphics on a really big screen with a famous narrator. 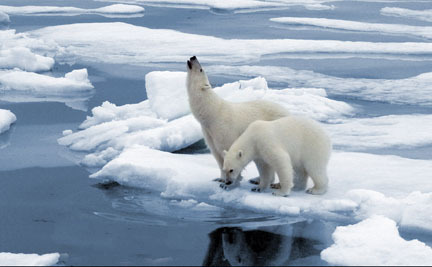 My favorite part of the film was the graphics they had with the sad little polar bears who couldn't find ice to rest on, and as a result were drowning. Now this is a very sad thing, and in fact, this would make an excellent Pixar movie, that would surely pull on the heart strings of many. Ular the Polar Bear searching for a piece of ice to rest his weary body in water that's just degrees to warm for stable floating ice conditions. 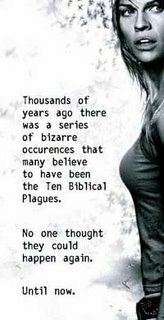 Most people have some sort of understanding of what the Bible is, and what it means. 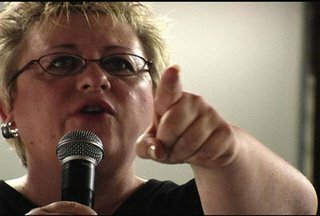 Tonight my wife and I watched Jesus Camp, and I think the most interesting part of watching this film was that although I found Becky Fischer's methods and tone to be inappropriate, at the same time I agreed with much of her basic teachings. Directors Heidi Ewing and Rachel Grady did an excellent job at what my middle school English teachers always encouraged us to do: "Show, not Tell." Ewing and Grady didn't tell us what to think, although it's a logical conclusion that the majority of a viewing audience would watch Becky Fischer at the Kid's On Fire camp at Devil's Lake, North Dakota, and think "Are these parents idiots?" 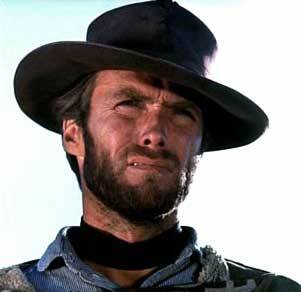 But it was interesting, because even for myself there were parts of my yoke that overlaped with Fischer's yoke. The thing that really bothered me about Fischer, and really radically conservative Christian Fundementalist, is that that there yoke places an undo importance on God's love for America and American politics. (observe this church sign here). And the unfortunate thing is that in Jesus Camp this is how all Evangelical Christians are painted. 25% of America may be Evangelical Christians, but many of those Christian's might consider themselves politically moderate, they might have different thoughts in speaking in tongues, and they may happen to be incredibly anti-homeschooling, etc. It's understandable why after the filming and release of this movie Becky Fischer would deem it neccesary to close her camp, but that does not mean that the issues that arise in this film are not prevelant. I think this film is a good beginning of dialogue for many people, especially Christians because there is a tension in knowing what is and is not appropriate in raising children. Ultimatly those decisions lie in the hands of parents, and this film creates a great opportunity to discuss the role parents should and should not play in raising their children in a home with a faith dynamic. Besides the illumination of Fischer's yoke placing extreme importance on American politics and George Bush, I also didn't like how she was using Muslim parents as examples of how Christians should raise their children. Christian militantism is certainly not a part of my yoke, and hence this was very disturbing. Also, Ted Haggard made me very uncomfortable in this film. Fischer seemed like she trully believed in the things she was teaching her kids, while Haggard pastor of New Life Church and leader of the National Association of Evangelicals was very inscincere and gave me tons of icky feelings, not to mention the recent allegations that Haggard has a habit of engaging in the same homosexual behavior he strongly preaches against. Be sure to read my wife's perspective on this film which she posted immediatly after watching this film, as well as previous StrangeCulture post mentioning the newly-Academy-Award-nominated film: Jesus Camp. Thank you academy for at least keeping the award show a little interesting with a few surprises (certainly not a lot, but a few). I'm not surprised that Eastwood's Letter From Iwo Jima broken in, but even so I don't know if I would have been able to predict who would get kicked out of the top 5 prize circle. 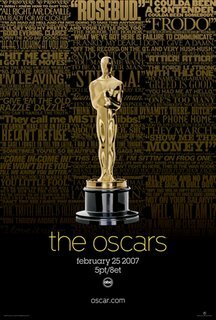 The big talk today will obviously be...Ryan Gosling over Sasha Boran Cohen for best actor, Mark Whalburg over Jack Nicholson, and Leonardo diCaprio being chosen for the Blood Diamond instead of The Departed. 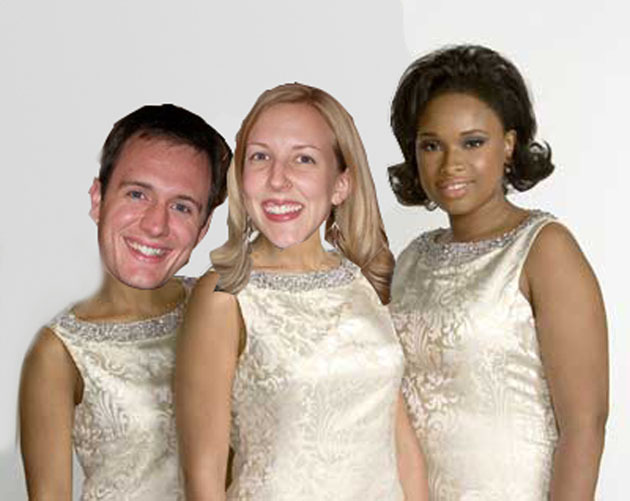 In fact, Dreamgirls really just didn't get the love that some people expected...no nomination for Bill Condon. 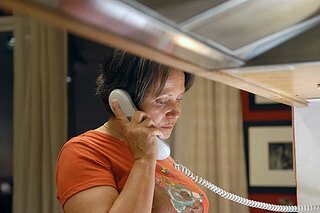 I'm glad Abigail Breslin got the nod, and Adriana Barraza for supporting actresses. Of course, there were no "surprise" supporting actor winners, but it was hard to tell which way that race would go, so congrats to those nominees in one of the most competative catagories this year. I was glad to see Djimon Hounsou enter into the top 5 here. Also the best director catagory was fairly competitive this year as well...I was of course, really glad to see Paul Greengrass get the nod. It is certainly deserved. Even though Sasha Baron Cohen did not get nominated for his role of Borat, he is still an oscar nominee today, but for writing not acting (Ben Affleck could tell Cohen a thing or two about that). Guillermo del Toro's Pan's Labryinth also picked up a number of nominations (Best Foreign Language Film, Art Direction, Cinemotography, Original Score, and Make-up) and really became one of the films with the most nominations this year with all it's technical nominations. Dreamgirls is the big winner in the original song catagory picking up three nominations for Best Original Song in that catagory (Listen, Love You I Do, and Patience). The other nominations come from Cars and An Inconvinient Truth. 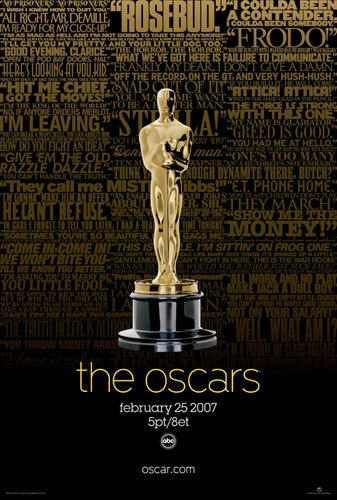 This creates the goofy statement "Dreamgirls' got the most nominations, but not best picture." This was also Meryl Streep's 14th nomination and as discussed earlier in the yaer, her 14th nomination came from The Devil Wear's Prada. 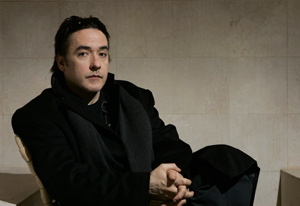 Also Golden Globe best original score winner Alexandre Despalt received a nomination for the 79th academy awards, but not for The Painted Veil (his winning score last week) but instead for The Queen. Could Ewan Smell Like Teen Spirit? In 1994, 27 year old rock-idol Kurt Cobain commited a suicide, after amazing success as front man to Nirvana in the early 90s. Courtney Love married Cobain in February of 1992, a little over two years before his death. Now more than a decade later Courtney Love has acquired the rights to a Kurt Cobain biopic called "Heavier than Life" written by Charles Cross. 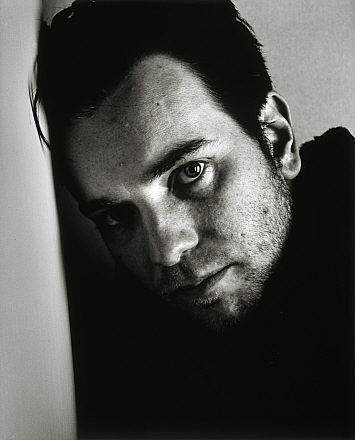 According to Virgin Movie News, Ewan McGregor is being rumored to star in the film a Cobain. 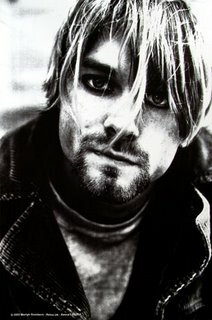 Every musician bio-pic seems the same, whether it's Ray Charles, Johnny Cash, or now Kurt Cobain. There's a young person's quick success, emptiness, and drug abuse. Yet this depressing formula made for two successful movies with Ray and Walk The Line, so why not change music genres and tell the same story with a widely popular punk rockers sad story. While I'm sure Ewan McGregor would do an excellent job, I could easily see the role going to someone else, as this is still a very early rumor. The Sacramento Bee has posted audio clips of KDND's Morning Rave talk show from the morning of January 12th. The following are roughly transcribed clips from 107.9 The End's Morning Radio show, were Jennifer Strange and the host of the Morning Rave talk about the contest. Listening to this in retrospect is very sad. The radio clips can be heard here or read in part below. The most ironic thing is that they discussed the possiblity of someone dying that morning, at of course, it was all in jest, but the host talk about how they will not be responsible because the contestants have all signed waivers. According to most news sources 10 people have been fired from the station since the insident of those, it is assumed that the host (Trish, Maney, and Lukas) are included. Guy Host 1: Fester, how much water do you think you'll have to drink before you have to Wee. Guy Host 1: 2 gallons of water! Ah dude! Girl Host: Can't you get water poisoning. Guy Host 1: Your bodies 98% percent water why can't you take in as much water as you want. Guy #2: What about that poor kid who was in college? Guy #1: I know, but he was doing other things. 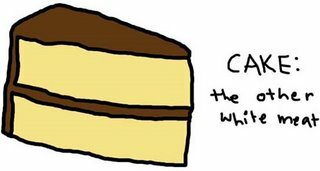 Girl: I know, that's what I was thinking, maybe we should have researched this before. Guy #2: We never do this before I start doing something, next thing you know I break out in hives and I'm in an ambulance. Guy #1: If it gets dangerous for someone there body will automaticly throuw it up, and if someone throws up there out of the contest. Eva (on radio) Eva, what do you want to say. Eva: I want to say those people drinking all the water can get sick and possibly die of water intoxication. Guy #1: Yea, we're aware of that. Guy #2: They signed releases, so we're not responsible, it's okay. Guy #1: If they get to the point they have to throw up, then they're going to throw up and they're out of the contest before they die, so that's good, right? Guy 1: Hey Carter, is anyone dying yet? 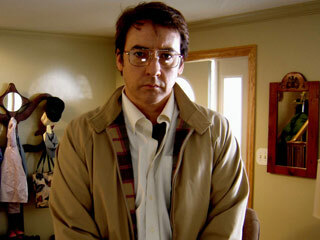 Carter: We got a guy just about to die. Guy 1: I'm glad we laugh at that. Guy 2/Girl: Make sure you get the insurance. Sign the release get a stretcher. Radio stations usually have fun webpages...not boring text heavy front pages like the webpage picture shown to the right. Last Friday 107.9 The End (KDND) out of Sacramento, California held a radio contest called "Hold your wee for a wii" were contestants were challenged to see who could drink the most water with out having to use the restroom. The contestant that could go the longest would win a Nintendo Wii. Yet, one contestant Jennifer Strange died of water intoxication (hyponatremia) at home hours after the competition. I post this, one because it is very sad, and tramatic. I feel sorry for the friends and family of Jennifer Strange. I also imagine the staff of KDND's moring show (The Morning Rave) feel awful. 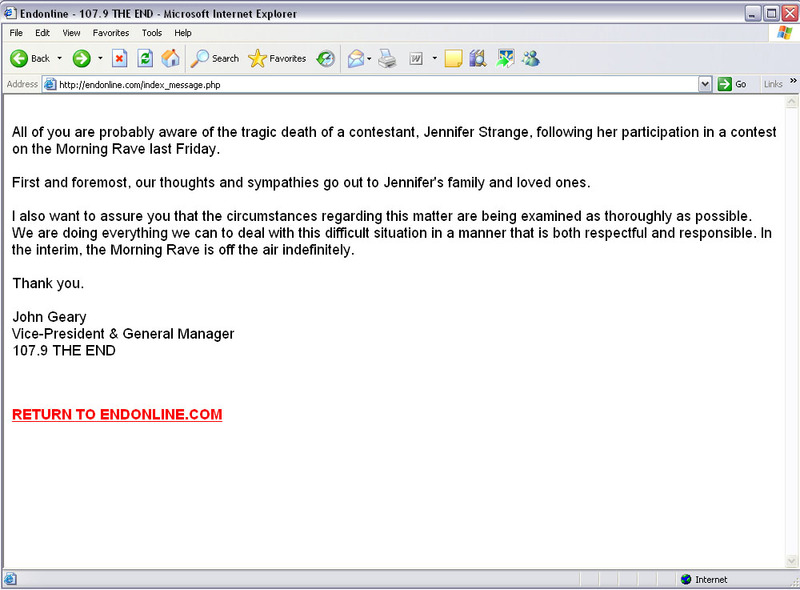 The front page of the KDND's webpage is posted above where VP John Geary states sympathy to friends and family of Jennifer Strange and states that "Morning Rave is off the air indefinitely." Interestingly, this sight has gotten a fair number of hits in regards to the news event over the past couple days, because of the title of this blog (Strange Culture) and it's relation to the water overdose victim. Also, I did a post as a gag were I posted a "water drinking contest" on the world water day website, which incidentally got published on the site. A number of side effects, some fatal, can result from drinking too much water. Cancel the competition! It is unsafe. A woman just died in the States after a water drinking contest. Contests that encourage people to consume ANYTHING either too quickly or in too large a quantity are generally not a good idea. I've spent some time tonight watching ads from husband/wife director Jonathan Dayton and Valarie Farris. Dayton and Farris are posed to continue to receive some more attention in the months ahead for their acclaimed work directing the hit indie film Little Miss Sunshine. 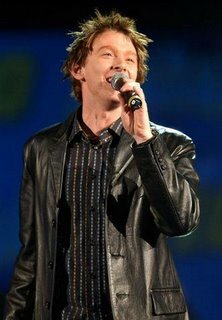 Dayton and Farris have already received a number of accolades for their work in the ad industry and for directing music videos and documentaries for such bands as Oasis, Red Hot Chilli Peppers, REM, and many more. Watching some of their advertisements on www.bobcentral.com (click on directors and the Dayton/Farris) and you will be able to watch many of their ads, like the popular iPod ad below done for Apple called "Wild Postings." 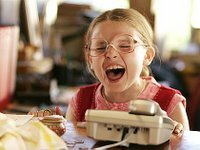 After watching these advertisements I am even more impressed with the work Dayton and Farris did in Little Miss Sunshine, because you can see how they were able to sustain their intellegent ad/music video style into a feature length film that is both engaging, entertaining, and fun. 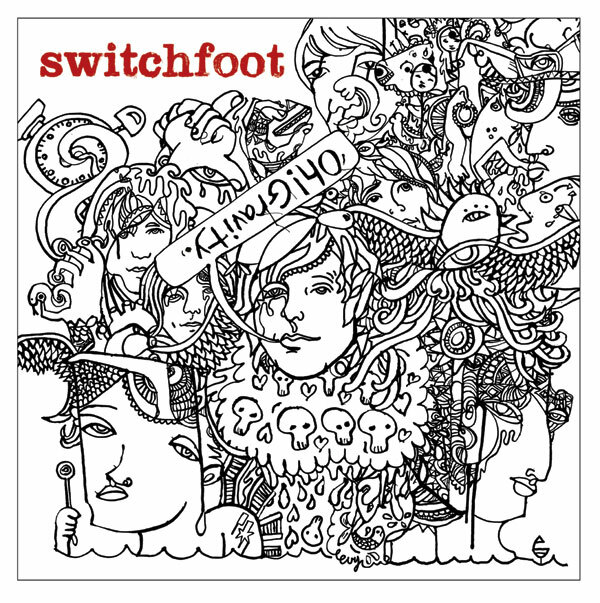 Below is a song by song digestable thought for each of the songs on the Switchfoot's newest project "Oh Gravity." The album overall is very enjoyable, and probably most resembles the style of the third and forth projects "Learning to Breath" and "The Beautiful Letdown." (This is their 6th Album). 1. oh gravity - the official theme song to the 2006 intergalactic olympics. Kind of fun, but in reality, not the strongest or most musical song on the album. 5. circles - Similar sound to Only Hope (1999), they totally would have included this song in the film A Long Walk to Remember if it had been written when the movie came out...as far as I can tell similar theme to Dirty Second Hands, just totally different tone. 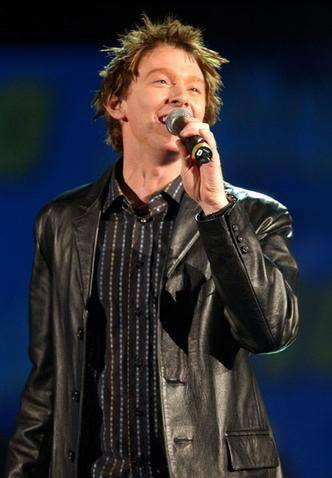 6. amature lovers - Has a Christian rock band every used the term "lovers" in a song. This song is certainly loads of fun with a high sing-a-long quotient. Much happier tone then the song Lonely Nation from Nothing is Sound. This would make a great 90s Theme Song (back when TV shows still had theme songs). This could be used for a show like Friends for sure. 7. faust, midas, and myself - much more grown up sounding then there song about Augustine's Confession (Something More, 1999). This is probably one of the primo best songs on the cd. I do like to count how many times in the song he says "you have one life, one life, one life, left to live." Wait, does this song have a similar theme to track 3 and 5...why, it seems like it...just a new angle, new tone, and lyrics. In fact the money theme sort of ties into american dreams (track 2) as well. This might be the thesis statement to the cd if the entire cd was an essay. 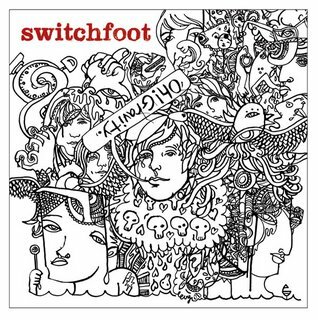 8. head over heels (in this life) - If someone else wrote this song people would probably say it was a cheap Switchfoot rip off...but wait, it is switchfoot. The song fits in on the cd, it's just kind of generic and cliche-filled. 9. yesterdays - Sounds like it came off the 2nd half of the nothing is sound CD, a very nice ballad. The best lines come in the bridge, "Every lament is a love song, yesterday, I still can't belive your gone"
10. burn out bright - this is one of those songs that's God but you won't really notice it on the album, if it were a single it would probably be pretty popular, but it's generally kind of generic. 11. 4:12 - this is my favorite track on the cd, but it's a strange favorite...it to sounds like a TV them song, but the energy in it is a lot of fun, I like the line in the song "you believe that all you are is material, it's nonsensical." This song always makes me want to clap in fun rhythms. Did I mention that I love this song. The title is in reference to the time on the clock when he's awake, a la 3am by matchbox 20. 12. let your love be strong - also could have been in walk to remember (like #5) but it's a little more "mature sounding" so maybe they would have thrown in the credits, or perhaps it could have made the cut on a Dawson's Creek episode...it has that sound of an "optimistic break-up song." It talks about your love being strong through many situations, even the hard ones...ah, how sweet. Over the Hedge doesn't have a prayer now...nor does A Scanner Darkly. The animated film catagory for the Academy Awards allows 5 nominees like the majority of awards in it's program...as long as 16 films are eligible in the animation catagory. Well this year has been full of animation...Curious George, Barnyard, Everyone's Hero, etc. 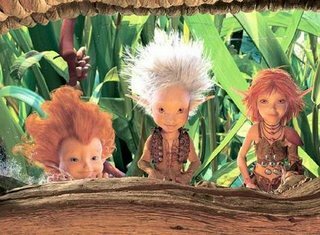 Yet the tally just dropped to 15 when the film Arthur and the Invisibles (pictured right) was ruled inelligible as less than 75% of the film is animated. It would appear now that the 3 pictures that will get Best Animated film nominations will be Cars, Happy Feet, and Monster House. Although I only sort-of-liked Babel, more and more Adriana Barazza is the supporting actress I have been most impressed with this year. There are many unrealistic characteristics to her character, but her compelling portrayl of the accidentally-bad nanny is very compelling. There's something to be said about a character who although completly flawed (as a result of the screenplay) who ends up being totally believable as a result of her acting. For other thoughts on supporting actresses see StinkyLulu's post here. "it sounds like that song is a total creepy stalker song, but then again, so was 'every breath you take." I got to agree Sting's "Every Breath you Take" is super-stalkerish. But my runner up for most stalkeresque song would have to be Invisible by Clay Aikens. There are few scarier lines in music than... "If I was invisible then I could just watch you in your room"